Cover artwork by Anaïs Rousset. First created in 2011 at l’Atelier du Plateau in Paris, the concert/performance “Printemps” offered audiences a hybrid between theater, music, sound poetry and political manifesto – for it was focused on the “Arab Spring” in Egypt, among other things –, where the intertwined words and voices of Julien Boudart, Xavier Papais and Egyptian blogger Aalam Wassef created a reflection on the magic of (new) beginnings. At the heart of this “soundtrack”, recreated here in the studio (disc 1), we can hear the quartet composed of Hugues Mayot (saxophones) Sylvain Lemêtre (percussion), Antonin Rayon (piano, keyboards) and Sylvaine Hélary (flutes, composition). 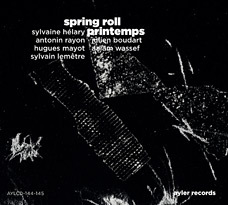 In “Spring Roll” (disc 2), entirely instrumental and somehow a musical mirror and an extension (through a brand new repertoire) to “Printemps”, the quartet delivers a highly sensory music, multiplying articulation strategies between composition and improvisation, and shifting from large areas of pulsed minimalist grooves to tightly written sequences. In both cases, a wandering and bright hymn to freedom, as much of invention and creativity as of speech. “Presence is the original political fact. Magic is the reconquest of presence.